Coming out of the Switch Event from last Thursday night, I have some additional thoughts about the Switch. I shared my first impressions back in October after the switch teaser trailer. My initial impression was that while I liked the system idea in general, I found it hard to think of ways its unique feature set fit into my lifestyle. Now that we have more details on the system and the games, I am still slightly cool on it. Andrew and I talked about the Switch at considerable length on our Molehill Mountain podcast this past Saturday. However, I want to share my own thoughts in a nice bite sized article for you. Let’s break it down to the good, bad, and ugly of the system. The games that are coming. There are some great games coming this year. First up is the launch game of Legend of Zelda: Breath of the Wild. The game has a great look and I really want to play it. It is probably the best possible choice for a launch title and is a system seller. Next up we have Splatoon 2, Nintendo thankfully avoided a terrible pun with the name. The game is a straight sequel and not just a port of the Wii U game. While we don’t have all the details of Splatoon 2, it looks to be a very good follow up to the successful Wii U game. Then we have Mario Odyssey. The game looks absolutely amazing. It brings back the open world level design of Mario 64 and has a wide assortment of unique levels with their own themes, including vegetable throwing. Everything about this looks fun, even the eyeball wielding hat. Next up, we have a plethora of RPGs coming to the system. Not much was shown of these games, but I love RPGs. Xenoblade 2, Fire Emblem Warriors, I Am Setsuna, Disgaea 5, Shin Megami Tensei, Project Octopath Traveler. Many of these have very little details but I look forward to them anyway. The next good thing is that the system uses USB-C to charge. this means that all those extra USB charging cables you have from your phones are compatible with the Switch and you can charge on the go from anywhere. I was really worried that Nintendo would implement some proprietary charging solution like they do with their handheld systems, which thankfully turned out to not be the case. Finally, the Switch will be region free! Nintendo has ended its policy of region locking its home consoles. This is something they should have done long ago. While they deserve props for this move, they shouldn’t be celebrated too much for a move that finally recognizes the world wide market for games after pretty much everyone else ditched it. What can I tell you. The bad is the pricing of not just the system but also of the accessories. To me, I think the system is probably $50 too much. If the system came with a pack-in game of some sort, that $300 price tag might be more palatable. The accessory pricing is even worse. $70 for the Pro Controller is about $20-30 way too much. Sure it comes with a lot of features and gizmos, but no other system has controllers that expensive. Then we have the $50 Joy-Cons that you can get for $80 as a pair. I don’t know who the individual controllers are marketed to. Considering each of the Joy-Cons have unique features, you really need both to have a full slate of features. To make matters even worse, Nintendo wants you to buy extra Joy-Con Grips for $30. The only plus is that the Grips that are sold separately are charging grips. The one that is packed with the system does not charge the Joy-Cons. So if you want to charge your four Joy-Cons, if you bought two extras, you need to spend $60 for two charging Grips. The final really bad thing is the battery life. If you want to play the system off TV for any extended period of time, you will have to have a charge cable at the ready as games like Zelda will drain the battery in under 3 hours. For the ugly, we have a lot. First up is the fact that Nintendo is selling extra docks. It is great that they are doing so, meaning you will easily be able to transfer the system from TV to TV. However, the docks are $90 each. Based on the information we have, the docks are simply a pass-through for power into the system and HDMI to the TV. It adds no extra processing or anything. Asking $90 for essentially a power hub is excessive. I am curious if it has any kind of DRM that would prevent a company like Nyko from making generic docs that you could buy for a fraction of the price. Next we have the paltry storage of the Switch. It comes with only 32 gigs of on-board storage. If we judge this based on the Wii U, which had the same, about 10 gigs of that will be taken up by the OS. Thankfully Nintendo allows for Micro SDXC cards to expand storage, but considering anything larger than 128 gigs gets rather pricey, you will still run into limits on your storage capabilities. This could be mitigated if Nintendo allows you to use more than one SD card and simply swap them out depending on which game you have installed on each, but that is highly unlikely. One rumor was that Nintendo would allow for USB storage. The system has a USB slot that is accessible through the dock, but there is no word on how that may be used. What about that online component? Nintendo not only wants to use your mobile phones for the bulk of the online work, they also want to start charging for it. There is no word on how in depth that online system will be or how much it will cost, but you will get one free SNES or NES game each month that you can only play for that one month. That is right. You get a “free” game that Nintendo will take back at the end of the month whether you were done playing it or not. Then we have some of the “games” coming out. First is 1-2-Switch, a glorified tech demo that Nintendo somehow thinks people will pay $50 for. I have a feeling that we will have another Wii Music on our hands here. It wouldn’t have been that bad of a game idea if it was a pack-in game that showed people the cool things the Joy-Cons can do. Further more, 3rd party developer support is rather slim. Bethesda is bring their 6 year old Skyrim to the system this fall. EA is bringing FIFA. Ubisoft has Just Dance 2017. Activision is bringing Skylanders Imaginators. A few other smaller developers have games coming. And that is all there really is, aside from the RPGs mentioned earlier. There is no strong 3rd party commitment from many of the big name development and publishing houses. If this is the level of support we can expect from 3rd party developers, the Switch will be a tough sell for a lot of people. All this compounds the sparse year-one line-up of games. There was also a lot missing from the Switch reveal. While a lot of games were announced, there were certain franchises that Nintendo ignored. 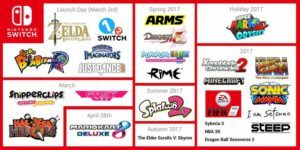 I don’t think that anyone expected Nintendo to release a game in every franchise this year, and they may announce some of these at E3, but it would have been nice to see nods to Metroid, Smash Bros, Donkey Kong, Pokemon, Kirby, Pikmin and more. If they had announced some of those franchises it might have made the low numbers of launch titles more acceptable. Again, they may announce some of these at E3 and that would be good, but it would have been nice to have some kind of confirmation now. While there is a lot to love about the Switch, I am still not fully on board with it. I expect that I will get one eventually, but I still don’t have a Wii U and with that system going into discount mode, I will likely get it and stock up on games from that generation and be set for a long while. I just don’t see me getting a Switch before this Holiday season but it may not be until Holiday 2018 when the system has a larger library of games, especially many of the RPGs that were teased. « Molehill Mountain Episode 32 – Will Nintendo Switch Dominate or Submit? A good article, covering most of the key points about this. One other to put in the “Good” column is that it seems some of the games on the Switch are embracing split-screen multiplayer, which has fallen out of favor on other consoles. This doesn’t look good, honestly. I’ll be surprised if this does even as well as the Wii U did. Although it is worth noting that Nintendo was able to turn around a poor 3DS launch, so we’ll see. Arstechnica has a great article about how Nintendo should have marketed the Switch as a handheld that could plug into your tv, rather than a home console that can also be a handheld.Had they marketed the system that way, they could have sold the Switch without the dock for $50-100 less and still sold the docks and JoyCon grips separately. Perhaps, but so far all of its advertising, including in Japan, is selling it as a portable console, not a portable that can output to your TV. That’s a good point. Remember the Super Gameboy? People absolutely loved being able to output their handheld to a TV back then; I don’t see why it wouldn’t be the same now. Yep. That is why I still have my GameCube. So that I can use the Gameboy Player to play the entire Gameboy lineup. I wish there was a way to play DS games on my television. Something for the Wii U would be great. Apparently that actually is possible through some very expensive third-party solutions (see eg. http://kotaku.com/my-quest-to-play-3ds-games-on-my-tv-1512835011), but sadly no first-party solutions. I’ve heard that (for the DS at least, not sure about the 3DS), Nintendo actually does have a cable that will output it to a TV, they just only supply it to developers but don’t sell it to consumers. Quite a shame.